Oh my – I have a carte vitale! Oh yes, the elusive green and gold card is finally here! You need a social security number too? If you are new in France and you’re not working for an employer with dedicated HR personnel who would deal with the sécu on your behalf, then you’re probably in a similar situation as I was. You will need to get yourself registered for a numéro de sécurité sociale. 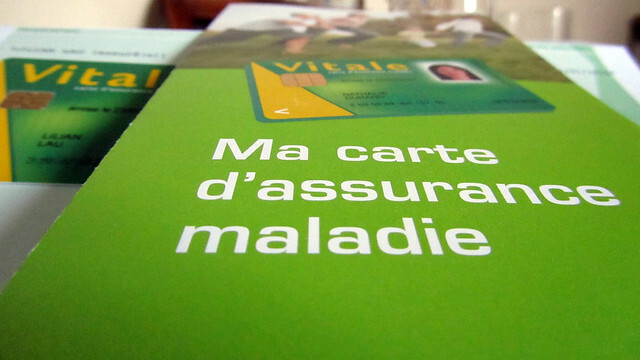 Information in English language is quite scattered and many sites simply say “apply for your card through your local CPAM (Caisse Primaire d’Assurance Maladie)” and the likes – not very useful. I hope this post would be of help to anyone who’s trying to obtain French social security number and carte vitale, but know that I am writing based on my personal experience. The information is current as of early 2013 but liable to change. Be prepared for things to be sidetracked. I thought I was quite dilligent and yet things went off-tangent before they finally became right. Just to establish some background: I am employed full time on a CDD in Paris, I am a legal resident in France with relevant carte de séjour and I also pay monthly cotisation (deducted at source) towards the national healthcare system via Urssaf (i.e. the organizations for the payment of social security and family benefit contributions). I am therefore covered under the national healthcare insurance. I do not have any dependant to declare. All residents in France are legally required to have a health insurance, whether through public and/or private coverage. The public health entitlement (and other social security benefits) depends on a number of factors, including nationality, residency status, work status and contribution to the system. In order to obtain public healthcare coverage, registration at the local CPAM is a must (there is at least one office in every département), usually 3 months after arrival in France in the case of most foreign residents. As an employee, my contribution payments started with my first payroll. However, during the application period, I did not have a fixed social security number, just a temporary one. It was not until my application has been accepted and approved by CPAM that I received a permanent social security number. Once I have the number, I am entitled to social security benefits (my understanding is that the amount of entitlement correlates to my contribution in sum and in duration) including public healthcare, hence the provision of carte vitale. I assume that all my other contributions are now attributed correctly to my new social security number too (as they include pension contribution, unemployment insurance etc). All documents that are not already in French must be translated by court-certified translator. Some clerks will accept certified translation from abroad, some insist on translation by local certified translator. To minimise the risk of having your translated document(s) deemed unacceptable, and also not to waste time and money, my advice is to get the translation done in France. You may search for certified translator using the sites of Cetiecap (in Paris) and Annuaire des traducteurs assermentés de France. If a certified translator for a particular language to French cannot be found, contact your embassy/consulate in Paris for assistance. In France, the information of someone’s état civil is maintained at the mairie of their place of birth. Any information of marriage, divorce, PACS, legal separation and death will be added to the birth record as “margin entries”, resulting in an updated version of birth record. Therefore, it is very common, when dealing with paperworks, to see a requirement for extrait d’acte de naissance or even the copie intégrale to be dated within 3 months for a French citizen. For a foreigner, the requirement for an extract of birth certificate is usually to be dated within 6 months. If you come from a country where the copy of birth certificate provided during birth registration is the one used all the time, this will make you question if such a recent birth certificate is possible to obtain. The answer is yes. Contact the registration office in your home country to obtain one (or several). I was informed that a new mandate was put in place last year, requiring foreign birth certificate used for the purpose of social security number application to be apostilled/ legalised, unless your home country has an exemption agreement in place with France. Apostille/legalistion is usually obtained in your home country from the Ministry of Foreign Affairs, although certain embassies/consulates in Paris – however, not USA embassy! – will apostille/legalise your document for you. I haven’t been able to locate a list of countries that are exempt from the social security website, but I found this list compiled in December 2010 (PDF) that outlines the countries in terms of the requirement of apostille/legalisation of civil documents or exemption. This list is subject to change. For further verification, I suggest you contact the French embassy in your home country, or if you are already in France, to contact your embassy/consulate for assistance. Consult Ameli (official CPAM website) to identify your local CPAM (although I find the addresses for Paris incorrectly listed, so I used this listing from alloCPAM) and attend to the office with required documents. I find it best to go in the morning to avoid the long queue. Otherwise, bring a good book to read or a smartphone to entertain yourself while waiting. Usually there’s a ticketing system to indicate your turn. Request for an application form from the reception and fill it in while waiting to see a case worker. Submit the application form along with all documents requested by the case worker. You only need to show the original and give him/her photocopies to keep. The waiting game then begins. Should your dossier be complete and accepted, the application can be approved within a few weeks (time varies depending on the département and any backlogs during the period). Otherwise, it could take longer. A lot longer. When I first submitted an application, over a year passed with countless trips to CPAM to no avail. Part of the delay was beyond my control (i.e. CPAM correspondences to my “new” address were erroneously sent somewhere else! ), another part due to miscommunication. I had not yet learned then that I need to “decipher” extrait d’acte de naissance, which did not simply mean my original birth certificate and its translation which was done in Ireland, but that I need a recent copy which is legalised and translated. It is rather peculiar too that I kept getting letters saying I have not furnished my birth certificate, but the conditions I must present it were never specified either. I resubmitted a new application along with all documents required at the end of November 2012. By mid-January, it has been approved and I was given a social security number, together with an attestation certifying it. The social security number is 13-digit long plus 2-digit “clé de contrôle”. The 13-digit is further divided into 6 sets of number that indicate: (1) gender – 1 for male, 2 for female, 3 for transgender or foreign-born men in the process of registration, or even 7 and 8 for temporary number in irregular situations; (2) year of birth; (3) month of birth; (4) département of birth – 99 for foreigners; (5) place of birth; and (6) order number, in order to distinguish individuals born in the same region within the same period. Shortly after approval, a letter would arrive from an office that deals with issuance of the actual carte vitale. Affix a current passport size photo onto the assigned box, include a photocopy of acceptable proof of identity as listed at the back of the letter (e.g. carte de séjour) and return everything in the enclosed envelope. The new card should arrive about 3-4 weeks later. Voilà! The carte vitale contains relevant health insurance information (both public and private, if any) and facilitates reimbursement of medical expenses. Always hand the card over to the healthcare personnel so relevant consultation fees can be recorded. You will still pay for the treatment yourself, but the use of the card also automatically trigger a reimbursement process that will send the refund directly into your bank account. The card should be updated at least once a year and whenever there is a change to your personal situation, e.g. in case of change of address, birth of a child, marriage etc. The date for the annual update, which can be done at a pharmacy with card reader facility near you, is marked on the letter when you first receive your card. As the process of applying for a social security number and a carte vitale can be rather lengthy, if you have seen healthcare personnel(s) in the mean time (e.g. GP, pharmacist, dentist, etc) you should always demand for a feuille de soins. Once the social security number is issued, fill this piece of information onto the feuille de soins and sign the form before sending it away to claim for reimbursement. Any feuille de soins from the pharmacy must also include a little sticker from the box of the prescribed medication (just peel and transfer over to the feuille de soins) and the original prescription attached in order to be reimbursed. You can compile a bunch of these feuille de soins and claim the reimbursement in one go. Just make sure they are not dated in excess of 2 years. In order to get maximum amount of reimbursement for your medical expenses, you should appoint a primary doctor (médecin traitant). Here’s the form in PDF to be filled, and which should also be signed and stamped by the appointed doctor. It is then submitted to CPAM to be included as part of your healthcare record. Now, theoretically, my application was “submitted, processed and approved” within an efficient period of 3-4 months (i.e. November 2012 to March 2013). My earlier efforts which started in June 2011 has simply ceased to exist. How do I know my initial application is not the one in the system? Well, I submitted my médecin traitant information the first time round but completely forgot about it in November last year. When I check my current record on Ameli, it appears I do not have a declared médecin traitant listed. As I have sent away my stack of feuille de soins for reimbursement after receiving my social security number but without realising the sécu assumes I do not have a médecin traitant, I will very likely be penalised and receive reduced amount of reimbursement in due course. Drat! To set up the account, go to the account login page and click on “Je demande une code provisoire”. A pin code will be sent to you by post in about 10 days or so. With that, you can now login to your account together with your social security number as credentials. You may also (and should) change your pin code once you log in. Ameli also contains a lot of other information and is very useful, but the majority of the site is, unfortunately, in French. It outlines matters that I am unable to cover on this post today, including level of reimbursement for different treatments, pre-requisites for certain treatments (including authorisation from CPAM), differentiating between healthcare providers that are conventionée or not, etc. This is as much information as I think is useful in the process of application for a social security number and a carte vitale in France. I am only touching the process in the case of an employee of foreign origin, which is different from other situations such as those under self-employment regime, or students, or retirees. Nonetheless, I hope this forms a handy guide for anyone looking for relevant information. And remember, while the information is currently accurate, they may change without me being aware of it. Project 365 – Week 9 It’s my 2nd Pariversary! CONGRATULATIONS!! That’s super news that you finally got your Carte Vitale! I’ve just had the CPAM on the ‘phone telling me mine is to be re-instated. I went through Ayant Droit because my partner has lived in France since 2003. I am drinking Champagne as I type this! Thanks for sharing! This post is very informative! So the Malaysian government (JPN) does issue an extract of birth cert? I’m so glad that so far the government agencies here had accepted my birth cert translated by Embassy of Malaysia. Yes, Bee Ean, JPN does issue the extract of birth cert and it costs only RM5. Besides a lot of the mandates to tighten up the conditions of documents are quite recent from what I understood in conversation with case workers etc. In Paris, due to overwhelming backlogs, private companies have been sourced to process the applications. I had case workers who were lenient and took the copies I gave them, but subsequently rejected by whichever office actually dealing with the approval. They have been very strict on the copy being current and legalised. As there isn’t any Malay-French certified translator here, the translation from Malaysian embassy is accepted. Delighted you got your CV at last. Yet again, a super informative post! There really is a dearth of helpful information for anyone tackling French administration processes (in French or English). This post would have been a godsend to me 4 years ago! (I also had some difficulties getting my card – not as many as you – but still! It has been tough, trawling for info and going through the process for so long before getting it right. I have no wish for others to have to encounter so much difficulty that I thought, it would be terrible for me not to share the knowledge. Still, I think Oz’s administrations seem more straight forward. At least I haven’t heard of friends moving there having too much difficulties. Good luck! sept? u r back? we are going to HK to visit Em’s god daugther…her BFF one year old baby girl come Sept..shouldbe second half of the month…would love to meet up if timing is good yah! Yes, planning for Sept and uh-oh, I’m there most likely second half too. We’ll see. We’re aiming for 3 weeks, which in that case either be early to late Sept, or mid-Sept to early Oct. I’ll keep you posted when I know more. Hi, I am Irish, living in Paris and applying for a social security number. Thanks to your post I now realise the extrait d’acte de naissance is not my original birth cert and know why they keep sending letters looking for this stamped and translated!! Could you tell me where you ordered this and what translator you used? Did it need to be apostilled? Thanks in advance! Hi Susie – please check the information on this page re requesting for copy of Irish birth certificate. As for translation, check this list of translators available from Cetiecap. I have used Anne-Cécile Bourget before, but another friend recently recommended Philippe Salin (to another friend). As far as the information I have gathered Irish nationals are exempt from the apostille requirement but I’ll check with my friend Sarah to verify this. Oops, just realised the link doesn’t show up well here in the commenting section (I must fix the code) but hover over the “information on this page” and “this list of translators”. My friend Sarah got her carte vitale a few years ago when things were less strict than it is now – she didn’t even need to submit her birth certificate. After looking at DFA’s website, it seems the service of apostille for Irish document is very expensive (€40!) so I would say it’s best for you to contact your local CPAM and verify with them if you are exempt from the apostille or not. They have a list of countries exempted from apostille, and while I have included a link to PDF in the blog article above of which country is exempt or not, the document is dated December 2010 and information may have changed since. Glad to be able to help, et bon courage! Thank you so much for this, I am at my wits end, after a 3rd visit to the RSI office to attempt to sort out my cotisations, this was next on my list. Feeling brave I visited the local RAM office to be informed I have a temporary social security number and you know the story from here….. I now know what to expect and will tackle this one, hopefully with out too many tears of frustration …. This French administrative system… have they never heard of “Customer Service” or at least helping the public!!! Its totally bizarre. I’m keeping my fingers crossed for your Marion! Hopefully yes, armed with documents necessary (and no harm bringing any other official papers that you have just in case, e.g. auto-entrepreneur certificate etc) which they may not have asked now but could do at the time of your meeting with them. Bonne chance! Thanks for the info Lil, I will start this particular adventure tomorrow. In my case, I don’t have a job yet but I am married to a French citizen. I arrived in Paris last December 2012 and we started to process my carte vitale application last May. But they sent it back coz of a few documents that I need to submit (which I already did now). My question is, how long does it take to have a social number or carte vitale? I am worried coz I had a lot of medical updates at the moment (vaccine updates, etc) and every time they ask my carte vitale I would have to say it’s being processed. Is the process usually this long? If all your paperworks are in place and complete, it could take about 4-8 weeks. Otherwise, usually within a month, they will contact you to let you know what’s wrong/missing etc so you’ll have to submit that for the application to be re-assessed again. You can tell them that the card is in the process of application. Just remember to ask for the feuille de soins so you can make your claim later when you have your carte vitale. Also, do not forget to register a medicine traitant so you will get maximum reimbursement rate. This is fantastic! I’ve been wondering how to get all this done. Thanks a million for sharing the process! I’m finding your post really helpful for getting started with the application process. Thanks for writing it! I have a question though, should I get my birth certificate translated before or after having it apostilled? My recently-dated birth certificate is on its way to me and now I have to figure out whether to send it to be apostilled first, or translated first. Thanks again! Hi Gabrielle, the logical step would be to get a recently dated birth certificate and apostilled before posting to France. This is because some country consulate/embassy in France could not apostille the document and have requirement that it be done in the home country. It really is just the most sensible approach, in my humble opinion. Otherwise, it shouldn’t matter if it’s apostilled or translated first. Good luck! Thank you so much for the post, most useful info I’ve found in the week! I’ve arrived in MRS for 2 months and (it looks like) I’ve had my social security number (it’s written in my work contract) so I’ll only have to apply for the Carte Vitale. But it doesn’t look like much easier though, as I speak very little French. I’ve checked your list of country and found that mine is “dispense”, does it mean I can use the original birth cert, or do I still need an “recently dated” one but without further additional information? Anw, I’m going to the office to check with them tmr, and may be find a form to fill (then will consult my colleagues who speak better French). Hi Sandy – it could be a provisional number that they provided initially but I can’t say for sure. Regardless if you are required to have apostille/legalisation step or not, birth certificate always need to be a recently dated on. Same goes with its translation. This is a source of frustration for many expats where our home countries don’t add annotations to our birth certificates. Even though they stay the same, we had to get new copies and translations every year for different administrative purposes! I really hope they will do away with this silly rule. Hi, Thank you so much for sharing most useful I have seen on this complicated process! We moved to France in September 2013, my 3 children are now at school here. Neither my husband or I are working yet. Do you know if we can still apply for a social security number and carte vital if we are not employed? I have applied to CAF but they have asked for my carte vital details. Hi Rachel – I’m afraid I am not familiar with the circumstances you are in to advise, so you should probably ask CAF how to go about getting one. Anyone that I know who are non-French got their card because they have health cover via work, or they are included under their (French) spouse’s coverage. Good luck! Im at the moment in Philippines..Have had a health problem (heart attack)and seek reimbursement on my carte vitale. who do i contact and can you give an email address. Need your reply urgently. Carte vitale reimbursement does not work outside of France. Even within Europe, you’ll need an European Health Card. You should contact your health insurance or travel insurance provider for further assistance. Good luck. Very informative and thank you so much for sharing. How can I obtain a temporary social security number – I have been offered a job but need the number – head is reeling with all the info on websites. Hey Jo – sorry, I’m afraid I don’t know. I was given a temporary one by my HR so I never did try to get one myself. I know of people who didn’t have to get anything translated . Are you French? ? IfSeems as if it were written by a French person judging by some of the (vert minor ) errors in it! Nice blog but do you think the process is the same for a French person as for a EU (or non EU for that matter) immigrant/settler? No, I am not French, and so I would not know what the steps are for a French person to obtain their cards. I’d imagine a non-French EU citizen would have similar steps (e.g. no carte de séjour required), but what I’ve blogged above is my experience as a non-EU citizen. I was informed that certified translation is a must, but if someone managed to get away without it, I guess he/she got lucky with the case officer that he/she met. Anyone I’ve spoken to have needed that. Thanks for the information. I am in the process of completing my wife and my application process as US expats retired to France. I appreciation the insights. Hi Alan – fingers cross that everything will go smoothly for you and your wife. Happy retirement! I’m glad to hear you finally got your card. I’ve been here over three years and have yet to obtain one. I gave up after several failed attempts. I obtained my certified birth certificate and will now make one last push to get the card so I can get reimbursed before I leave for good in December. Words cannot describe what a farce this whole process is. The administrative section could definitely improve on their service, and to communicate between the agencies. Imagine how incredulous it was when once, during my appointment, the agent tried to call another office by direct number, only to be told that that entire office had actually moved elsewhere and so the number no longer valid to reach her contact! Thanks for your posts, they are immensely useful especially for someone who can’t speak French. :p I just have a question for you, do you need the carte vital before getting reimbursed for any medical expenses? Or do I just need my “permanent” social security number? I’m leaving in a couple of months so I’m pretty sure I won’t be able to get my card by then, but it’d be nice to be reimbursed for doctors visits since I’ve been paying insurance! Hmmm, if I recall correctly, I submitted feuilles de soins to my local CPAM as soon as I had my permanent social security number. Make sure your forms are complete (with the number, date, name, address etc – basically the top section for personal info, in case there’s any gap not already filled by the healthcare providers) and signed at the bottom. Make a copy of every form that you plan to submit as well as any accompanying prescriptions. I even prepared a summary page to list out the medical/dental visits that I made in date order, and the amount I paid for each visit. Since this is your first claim, don’t forget include a RIB as the reimbursement is made directly into your bank account. Depending on the processing office, the reimbursement may or may not come in a single go. In my case, I was reimbursed separately for GP, dentist and pharmacy-linked transactions. Thanks for your prompt reply! Right now I’m stuck at the process to obtain my permanent social security number. They’ve requested for my birth certificate and so I’m trying to get that into a form that’s acceptable to them. Hopefully that doesn’t take too long – would you happen to remember if you had to wait long for the permanent SS number? Just an FYI (if anyone reads down this far!) but the CAPM ? Ameli number for English speakers is incorrect in the link posted (it’s incorrect on their website.) I just went round and round with different operators in French / English, and the actual number for English speakers is (from inside France) 0811363646. Thanks Julie for the info! This is very useful indeed, since the info I’ve provided would be from some time ago, and I don’t particularly have time to keep abreast of any updates. Hi. I have a simple question. I have a Carte Vitale. If I require medical treatment in the US, may I submit bills for reimbursement to the French health care system? Hi Jack – I’m afraid I’m not the best person to answer this; it would be best to contact the CPAM directly. In any case, I believe it is not possible to submit bills from the US for reimbursement to the French healthcare system. Perhaps exception can be made if it’s something specifically ordered by a French doctor and this treatment is not available in France or in the EU, and it has been approved by the CPAM? Even within EU itself, as far as I know, the residents entitled to a country’s healthcare need an European Health Insurance Card in order to get (temporary) state-provided healthcare when they’re travelling, and which does not guarantee free service. Hi there. Thanks for the reply. I tend to agree with you but I wonder, what about a French citizen traveling abroad who encounters a medical emergency? Surely there is a provision for that? You would need to have holiday insurance from your “mutuelle” to be covered in the US. Aha, so I need to purchase supplemental coverage. Ok, that makes sense. Thank you! The government provided healthcare system is not to be a substitute for holiday insurance, so like Sarah said, appropriate top up would be required. Just like typical holiday insurance, any kind of medical emergency needs to be reported as soon as possible and gets the go-ahead from the provider in order to ensure reimbursement. Hmmm any thoughts about those who are born in a country that is not their nationality? I have a consular report of birth not a birth certificate so I am not sure how this will play into this! Alternatively, if this consular report of birth is normally treated as equivalent of birth certificate, then try requesting for a copy of the consular report of birth which will be dated at the date of issue following request. That should hopefully do the trick. Hi Gavin – any information that I have is on this post. Otherwise, towards the end of the post, there is a phone number you can call for assistance in English. Good luck! Hi this article is very informative. I have recently received my Carte Vitale and now I want to claim all my past medical expenses occurred for my child and spouse. Could you tell me what is the procedure because I still don’t have any french mutuelle so I am afraid that CPAM will not reimburse whole amount. CPAM and mutuelle are different things, and even if you have mutuelle, CPAM does not reimburse the whole amount; it is the mutuelle that reimbursed the allowed complementary amount. If you don’t already have a mutuelle, I don’t see how you could get one which would cover costs retrospectively. To claim amounts reimbursable by CPAM, you need to already have the feuille de soin provided by the doctors/pharmacies/dentists etc, fill those correctly and include your social security number, plus medicine box label for prescriptions-related claims, then submit it to your local CPAM. Thanks a lot! I have found your information to be very very useful. I had few additional queries which if you can advise will be of great help. 1) My wife is 1 month pregnant and I have consulted a prenatal Doctor and she has recommended Blood tests & Ecography. Do I need to get the primary doctor (médecin traitant) form signed by her or is it not required for maternity cases. 3)I consulted AXA for mutuelle insurance. They told they are ready to execute the poilcy(once SS number is issued) even if my wife is pregnant. Can i get the current bills reimbursed retrospectively once i get my social security number? Hi Subhra – I’m afraid I know nothing about maternity-related reimbursements, but I’d imagine any form of treatment/consultation that you can get a feuille de soins for should be reimburseable by the CPAM, up to the allowed limits. As far as I know, each feuille de soins does not have to be signed by the médecin traitant. As long as a médecin traitant is declared on your CPAM account, should be fine. Imagine having to bring the feuille de soins from pharmacy/dentist etc to the GP each time? Should everything runs smoothly and you have provided full set of documents, you should normally get your number and card within 4-6 weeks, but it is never easy to predict because it also depends on the workload at the centre processing your papers etc. Please note that reimbursements from CPAM could be claimed up to 2 years later via the feuille de soins system, so all that you have right now can be claimed. I guess the following is one way to see the CPAM/mutuelle systems separately: You’ve paid contributions towards public healthcare system since the day you started working, so you’re covered for reimbursements even if you have not yet received your social security number. “Retrospective” with CPAM here still includes period you’re covered. Mutuelle is a private health insurance top-up system; if you don’t have a contract already signed and not paying related dues, then you’re simply not covered. Thanks a lot for the reply…appreciate you kind feedback on the same. Yes i will check with my HR if there is any temporary number to begin with. I’ve got a job now in France and they’ve asked for all the documents therefore I’ve tried to get the documents from England to apply for my sécurité sociale number but the birth certificate is the original. I presumable have to reapply for a new one and have it signed and translated? If I have to have it signed where would you advise that I have that done in England? Hi Jamie – you will need to reapply for the birth certificate. I have the impression that English birth certificate does not require apostille/legalisation (or at least that’s the case with most – not all – EU countries). You’ll be on the safe side for translation if you just get it done here in France through court-approved translator. Good luck! Ps: maybe you can ring your embassy to double check? I feel so thankful after reading this article and I found it so informative and helpful for refugee like me in France .. Thank you so much..But as for me still I didn’t got carte vitale..Its very difficult in France without French basic. Hi Dorji – don’t lose courage, be persistent. It took me a while too despite being employed and speaking French. Good luck! Thanks for this detailed summary. I became resident in SW France last year completed the dossier prep (all the paperwork translated and photocopied in triplicate)..and after reading up on the subject I was determined that I would go through the whole process of getting a Carte Vitale ‘under my own steam’….rather than use one of the many intermediaries….Sat back and waited patiently for more than 10 months..had to resubmit my French bank details (somehow they had got lost)……Was notified a few weeks ago that I could go online to set up my online account with Amelie in order to trigger the issuing of my card ( but encountered problems and got caught in a loop which wouldn’t take my entries ! Urrgh ! )…..and had to write to them about this about a month ago. However, patience and persitance has paid off and today my long awaited card arrived…All through my own efforts..and I now feel suitably empowered ! Halleluia ! I am very impressed with the info and level of detail supplied in this blog (eg decoding the social security number digits). Thanks, I have signed up and will be printing this off to store with my Amelie stuff for future reference. And, do you think it will get there in 5 days? I checked my mail late and if I go tomorrow, I will have 5 out of those 15 days left for it to arrive! Le Mans is not a Parisian suburb, so put it into the province box. Make sure you use the stamp for lettre prioritaire and not lettre verte, it’ll get there quicker. Thanks for sharing, just about to start this process! I worked – and paid French taxes – for 18 years in France, have a French passport and Carte d’Identite, but I have been living out of France since 2005. I’m moving back. My carte Vitale is expired. Do you know if I have to reapply or my expired Carte Vitale can be renewed? Dear Caroline – the carte vitale has changed since 2007 (the new card has photo on it) so I’m not sure if it can simply be renewed, which is usually the case for most people after updating their information to the system. You should contact the CPAM closest to you for information and make sure you’re affiliated to the right caisse to start with. Once renewed, just don’t forget to get it updated at the pharmacy or CPAM once a year. The CPAM I am attached to have machines that I can simply update my card on without needing to queue up for the service.